Organic Spirulina is perhaps the most popular superfood. It is an ancient blue - green algae cultivated in special fresh water pools in a pure organic environment. 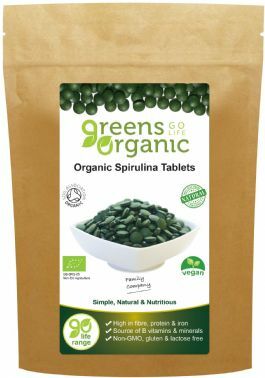 Greens Organic Spirulina is bursting with vitamins, minerals and amino acids including vitamins B2, B3 and B12 along with Iron which contribute to the reduction in tiredness and fatigue. 60% protein and an excellent source of vitamins A, K1, K2, B12 and iron, manganese and chromium. Also available in tablet form.